There are a few modelers out there on the internet whose work always catches my attention...Paul Boyer, Mike Grant, Tony O'Toole, Joe Youngerman and the author of this new book, Libor Jekl. If the work weren't enough, the book is one of the few modeling manuals that is dedicated to 1/72 scale modeling. (The only other one that comes to mind is the previously mentioned Mr. Boyer's "Building and Displaying Scale Model Aircraft.") 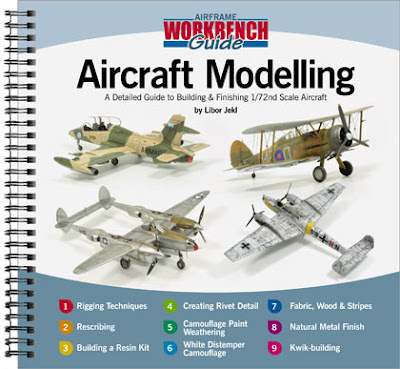 It appears to me that many how-to books often avoid 1/72 subjects in favor of focusing on larger 1/32 and 1/48 models. Maybe it is easier to illustrate the author's techniques? The other unique thing about this small ring-bound book is that it is not an introduction to modeling or even a complete modeling manual. Jekl focused on more advanced skills, often related to finishing, and skipped all the basics. 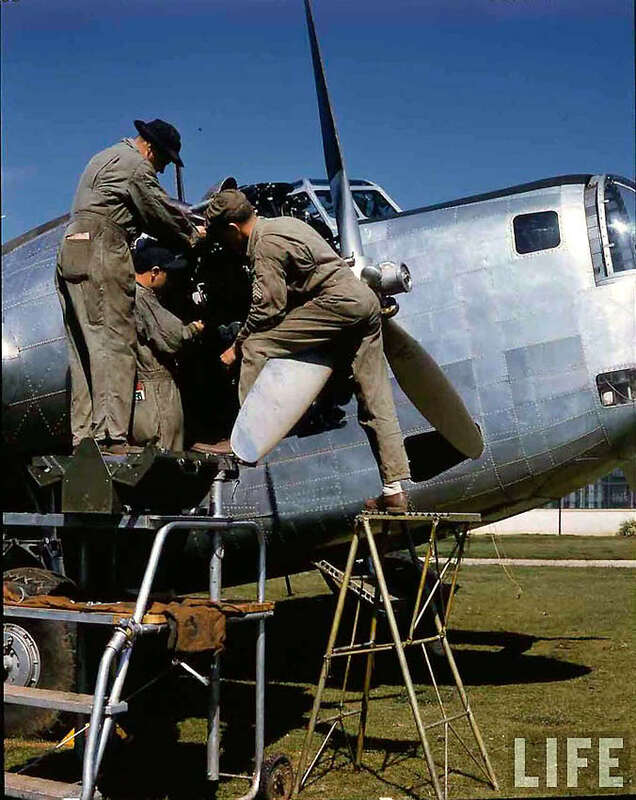 For example, the first chapter (on rigging) opens with the Gloster Gladiator in primer. Besides rigging, the book includes chapters on scribing, rivets, weathering, natural metal, and resin kits. The final chapter is interesting in that it gives the author's tips on how to finish models quickly...oddly named Kwik-building. All are worth considering, but the last one is possibly the most unique suggestion I've ever seen in a modeling book...to go out, take a walk, and get some exercise! Each chapter is profusely illustrated with in-progress photos and each chapter has a gallery of the finished project. I do wish more words were included to guide the modeler in each step; the book looks like a gallery of Libor's work. (Which isn't a bad thing. Looking at his models is fun.) The only real complaint with the book is that there is no consistent layout. Sometimes a set of steps are numbered 1-2-3, sometimes it is A-B-C, and sometimes there are no labels for the steps at all. This magazine is the first in a new series from Valiant Wings Publishing entitled, Airframe Extra. The concept is to combine history, modeling, and profiles into a periodical that will cover a conflict or a campaign. Next up are six pages of side views of RAF types by Richard Caruana. The modeling content starts with a step by step build of Airfix's new C-47 by Libor Jekl. 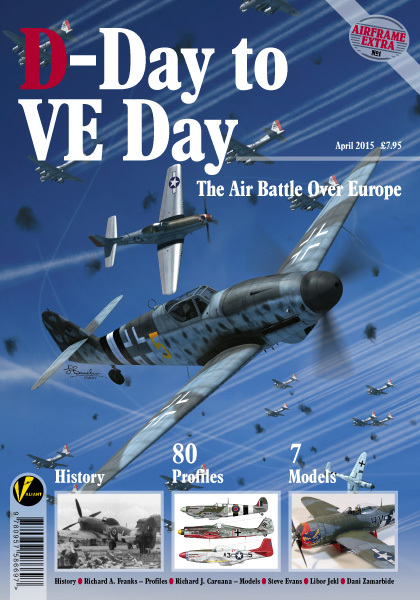 This and the following article on the Airfix 1/72 Spitfire XIX with aftermarket added are excellent and well worth the cost of the publication. Five pages of USAAF profiles follow, then a Colour Reference chart is included. This strikes me as an odd way to waste a page, but might be useful for modelers who don't have access to the internet? A Bf-109G, a photo reconnaissance P-38, and a two seat ME 262 are the 1/48 modeling content. Again, all the models are well done and step by step coverage is included. The Luftwaffe profiles are next and then the 1/32 scale coverage begins. First up is an excellent P-47D done by Daniel Zamarbide and then a short Spitfire XIX conversion. The Spitfire conversion is my only real complaint with this publication, as no step by step coverage is provided, which is even more glaring after Mr. Zamarbide's excellent article on his Thunderbolt. The book ends with a page of side views of Russian types. This is a really neat idea for a series of publications and I look forward to future issues that will cover the Korean War and the Battle of Britain. A nice little video of 1 (F) Squadron RCAF in action in order to celebrate Canada's Battle of Britain Day. Note: Hurricane YO-G is an example of a rare re-winged Hurricane. L1973 was built with a fabric wing, but it is clear by the time of this video that it had been refitted with a metal wing. 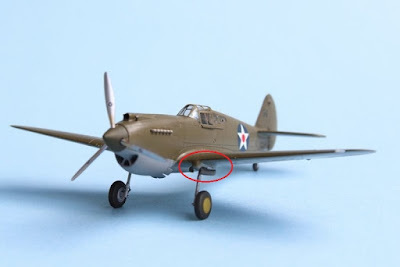 Modeler's Note: While we have an excellent fabric wing Hurricane Mk. I by Airfix, the two best options for a metal wing Hurricane Mk. I are either the old 70s Airfix kit or the newer and much more expensive Hasegawa kit. Sadly, the latter's quality does not live up to its high price tag. Come on, Airfix... issue a new tooled metal wing Hurri in 1/72! 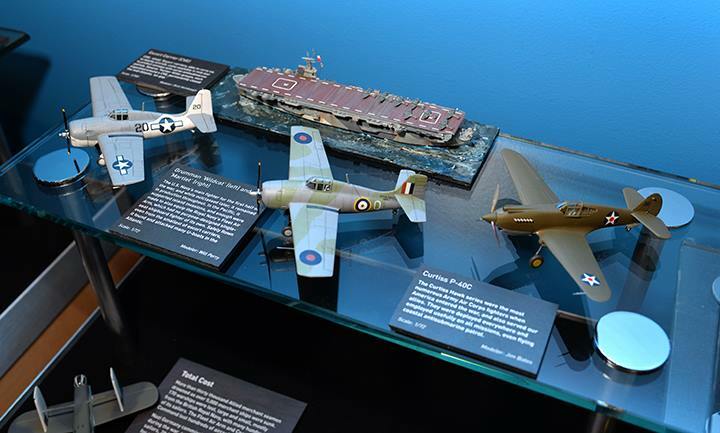 Seventy-five years ago this summer, Canadian pilots, along with their Commonwealth brethren, were valiantly defending England from Luftwaffe attacks during the Battle of Britain. September 15 has since been labeled Battle of Britain Day in the UK to commemorate the two large attacks against London and a few smaller attacks against other English cities. To commemorate those brave Canadian pilots, and especially those of 1 (F) Squadron RCAF, the RCAF painted up their 2015 demo Hornet in this attractive scheme. Coded YO-H, it has been painted up to memoralize Hurricane P3873 in which F/L Gordon D. McGregor was credited with the Squadron's first victory on August 26, 1940, when he shot down a Dornier Do.17 bomber. (Oddly, there are many references to the aircraft being P3863, which is a typo first introduced in Kostenuk and Griffin's RCAF Squadrons and Aircraft. Hurricane P3868 was on strength with 73 Squadron during the Battle until it was severely damaged on September 7, 1940.) YO-H was operated by 1 Squadron until it was shot down on October 5, 1940, with Senator Hartland Molson bailing out of the aircraft. Featured on the right tail of 188761 is F/L Gordon D. McGregor. McGregor made ace during the Battle of Britain and was awarded the DFC on October 25, 1940. Later rising to the rank of Group Commander, McGregor commanded X Wing in Alaska, was base commander at Patricia Bay in B.C., and finally, lead 126 (RCAF) Wing in Europe. 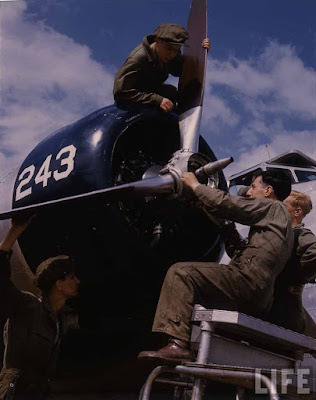 It has been stated that he was even flying sorties with 126 Wing as late as 1945 when he was 44 years old. After the war, McGregor was president of Trans-Canada Airlines, aka Air Canada. The right tail of the Hornet features British Primer Minister Winston Churchill. CF-188 Hornet 188761 was again chosen to the "colour bird" for the 2015 display season. It had previously served as the demo bird in 2014 when it carried the "True North Strong and Free" scheme and for a while carried a 409 Squadron "Nightmare 01" scheme with tails painted up with the Squadron mascot. Hornet 188761 also has the odd distinction of having two different pilots ejecting from the aircraft, once on October 20, 1987, at RAF Alconbury and then again on June 19, 2004, at Yellowknife Airport. 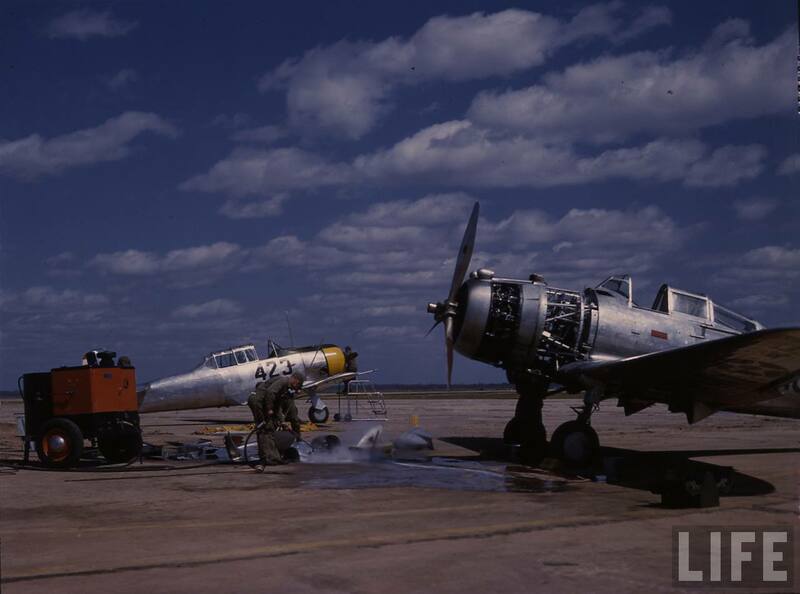 After both incidents, the aircraft was repaired and returned to service. The Hornet prepares for its first Twilight airshow of 2015. While I have not been a fan of the last few (dozen) CF-18 special schemes, I especially like this one. (I'm sure its historical connection and Hurricane content has something to do with it!) I wish the Squadron could have painted the whole jet in the Temperate Land Scheme, but there is some nice attention to detail included...especially the Hurricane wing gun patches that are painted on the leading edge slats. Modeler's Note: Really the only CF-18 to consider in 1/72 is the Academy kit. Canuck Models has recently reissued the kit with markings for YO-H. It appears that Hasegawa is going to be reissuing their old kit with YO-H markings in the near future, but I'd trust Canuck's research and decal art over that of Hasegawa anytime. Not to mention, the Hasegawa kit is a tough build and lacks detail. Some have asked why I included Maroon on the propeller blade of my recent P-40 (see previous two posts). 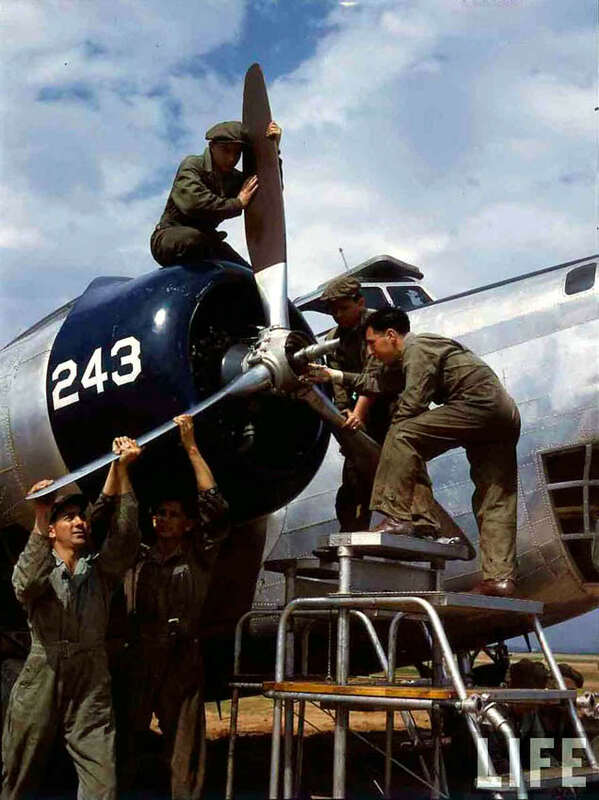 So if your USAAC or USAAF aircraft has a silver blade it should have a Maroon 18 rear face. If your aircraft has a black prop, it is the usual black overall with yellow tips. 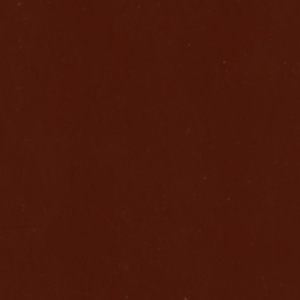 For my P-40, I used Vallejo Burnt Cadmium Red 814 as it was the only Maroon I had on hand. It appears to match the chip better than the photos. I made two mistakes on my P-40. The first is that I extended the Maroon to the hub of the spinner...oops. It should start from a scale 18 or 24 inches from the hub. Secondly, I did not have a chance to flat coat the Maroon before installing it on the kit. I think a nice coat of flat varnish would bring the colour closer to the look you see in the B-18 photos included here. Life photos are © Time Inc. used for personal non-commercial use only. The photographer was Dmitri Kessel. As I stated in the P-40 gallery, something didn't look right to me when I compared the photos of my model with the photos of the subject. There was too much space between the wheel and the landing gear door. I never actually noticed this on the model, but it jumped out to me in the photos. Fellow modeler Scott Hemsley and I discussed the issue and Scott pointed out the problem. It appears that Airfix got the gear legs a little long. Notice the collar in the red circle on my model? Notice its location on the real thing...in line with the bottom of the gear doors. Of course, my first thought is that I did something wrong, but looking around the web, it seems like this issue is featured on almost every model. So next time I'll shorten the upper part of the leg, confirm that the collar is in the right location, and see if it solves the problem. 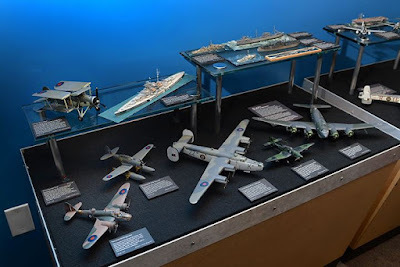 This last May, my local model club started looking for models to put in a "Battle of the Atlantic" display at the Museum of Flight. 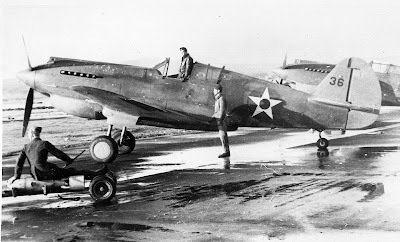 Remembering the mostly built but unpainted Tomahawk, I volunteered to build a USAAF P-40C. Why a USAAF P-40 in the Battle of the Atlantic? The kit has few vices. Sure, the wing to fuselage joint needed a little filler. Sure, the wing guns are liable to be knocked off. Most of the panel lines are fine for my purposes, but even I have to admit that the lines on the vertical fin are too heavy. Sadly, the canopy is too high, but I didn't replace it this time. 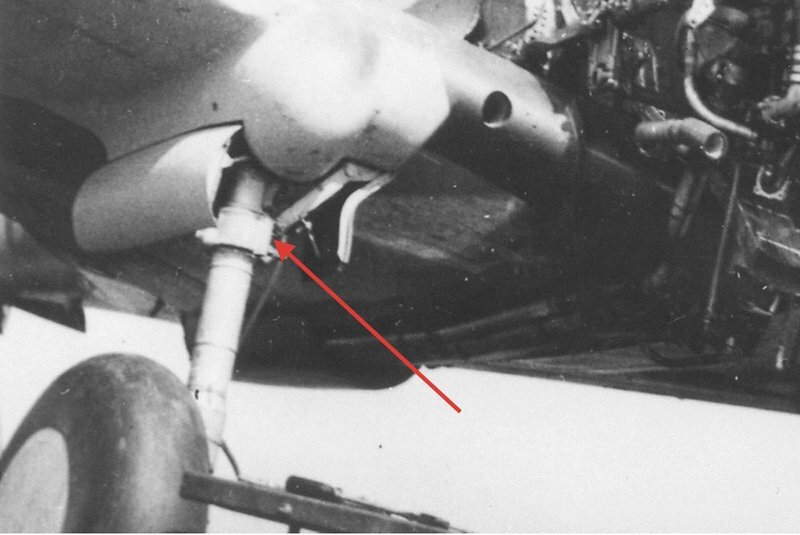 (I didn't notice this until I was compiling this post, but it appears Airfix got the landing gear struts too long on the kit. Compare the sit of the prototype with the photos of my model. Looking at other Tomahawk shots, I think the collars that are below the landing gear doors on my model, should end in line with the doors. Next time I build this kit, I'll shorten the struts a little.) Overall, I enjoyed building it and it makes a nice model. Paint is Tamiya Neutral Grey spray can for the lower surfaces and Mr. Color Olive Drab on top. Notice I even got the Maroon on the back of the prop! Decals are mostly Xtradecal but the 36 on the tail is from TwoBobs and the prop logos came from the kit. The final coat is from a Testors Acryl jar marked flat but it is more of a semi-gloss. I ran out of time to replace the gun barrels and to weather it, but I'm reasonably happy with the final product. It is certainly an improvement over the Blitz Spitfire. (I do, however, need to read up on model photography. Sorry the depth of field is lacking.) Even a dyed -n-the-wool RCAF fan has to admit this is a really attractive scheme and it suits the Tomahawk! On Thursday night, the model was ensconced in the Northwest Scale Modelers's display case at the Museum of Flight for the "Battle of the Atlantic" display. 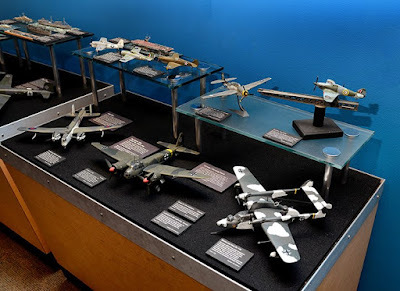 Thanks to the display producers for allowing me to include my model and thanks to club member Don Conrad for the photos of the display.